A little late at the presses, but it’s finally here. 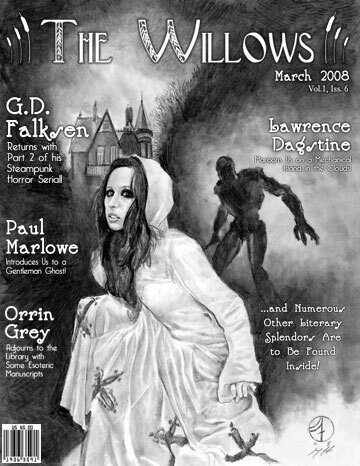 The Willows Magazine, March 2008 issue. 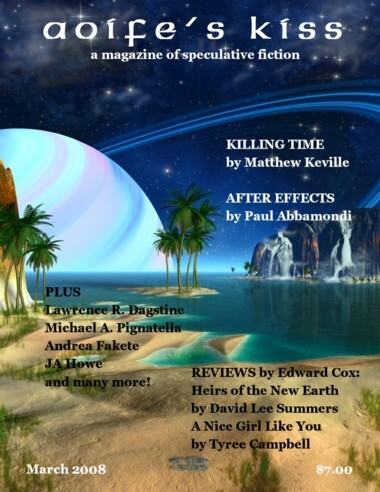 My Feature Author Issue! And I’m not the only surprise. You’ll find pre-World War Two/Victorian Horror and Dark Fantasy stories by names such as: G.D. Falksen, Paul Marlowe, Matthew Stiles, Orrin Grey, Skadi meic Beorh, and Lawrence Dagstine… Oh, and plenty more literary all stars and splendors await you, as we revolutionize today’s weird fiction. The Willows Magazine, edited by Ben Thomas, is now published bimonthly. It’s one of the freshest and fastest growing publications to hit the Lovecraftian world since… well, since Weird Tales itself! Subscribe or buy your copy today! 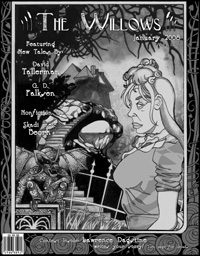 Through the work of rising authors like G. D. Falksen, Lawrence Dagstine, and Paul Marlowe, we are also pioneering the genre of “steampunk horror,” in which elements of the golden age weird tale or Gothic romance are combined with an elegant 19th-Century proto-science-fiction aesthetic, such as that embodied by Welles, Verne, and the earliest pulp writers. We love work set in Victorian times, in the European countryside, in a twisted fairyland, in the underbelly of an enchanted city, aboard a triphibian ambulator, or in the ruins of an undiscovered civilization. 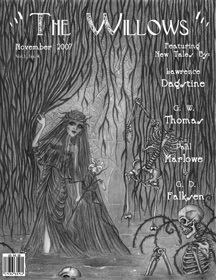 If your favorite authors are those who initiated and maintained the unique movements of weird fiction and proto-SF, and those who continue these traditions today, The Willows is the place to read tales you will enjoy, and to submit your own work! We warmly welcome new writers, but we also print pieces from established authors. First, I’m pleased to announce that March 2008 into April 2008 will be Feature Author month for me, and not just from The Willows Magazine, but a couple of other publications over the stretch of a month-and-a-half, too. It’s also the month of my birthday, and when I’m sure to hit the big 300 (no, not age, folks — publications; a goal I set out to do almost twelve years ago). But those will be plugs and blog entries in itself. Meanwhile, acceptance no. 298 comes as one of the headlining authors to The Willows Magazine for their March 2008 Issue, which might be a little late at the printers, but is due in the next week or two. I’ll put up another blog when the actual issue is released. In the meantime, be sure to check out two of their previous issues. They’re only $5.00 per copy, and filled with exciting pre-World War 2 weird tales and Victorian horror stories. I can be found, once again, as Feature Author in their November 2007 issue.